Several months back, after finishing an interview with Dr APJ Kalam, and just before leaving his Rajaji Marg residence he made me repeat these three words in a schoolteacher’s tone: perseverance, hard work and patience.This, he said, was alone the path to progress. Later, much later, I realised, that those were the very words he’s lived by all through his life. They are both philosophical and practical, quite like the world he grew up in as a boy in the island town of Rameswaram, in south India. His father, a humble boat owner, Jainulabdeen, was a devout Muslim and a close friend of the Rameswaram temple priest. Kalam was brought up in a multi-religious, tolerant society; one with a progressive outlook. His father often quoted from the Quran to make the young Kalam see the world without fear. He had seven siblings, and a doting mother who, at times, made chappatis for Kalam, while the others were given rice as Kalam’s day would start at four in the morning and end at 11 pm. His father wasn’t educated, but he wanted Kalam to study. Kalam would get up at 4 am, bathe, and then go for his mathematics class, which was taught by a teacher who took only five students in the whole session; and bathing before class was a condition he had laid to all his students. After his morning class, Kalam along with his cousin Samsuddin went around town distributing the newspaper. As the town had no electricity, kerosene lamps were lit at his home between 7 pm and 9 pm. 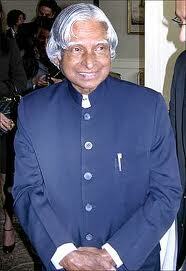 But because Kalam studied until 11, his mother would save some for him for later use. Being a bright student, Kalam always had the support of his schoolteachers. Schwarzt High School’s Iyadurai Solomon often told Kalam that if he truly, intensely desired something, he would get it. “This made me fearless,” said Dr Kalam. And outside school, Ahmed Jallaluddin, who later became his brother-in-law, and Samsuddin, encouraged Kalam to appreciate nature’s wonders. So at once, while growing up, he was exposed to a religious and a practical way of looking at the world. The flight of birds had fascinated him since he was a boy, but it was years later he realised that he wanted to fly aircrafts. After finishing school, he took up Physics at St Joseph’s College, Trichi, but towards the end he was dissatisfied. When he discovered aeronautical engineering, he regretted having lost three precious years. But he was glad to have discovered Leo Tolstoy, Thomas Hardy and F Scott Fitzgerald and other English poets in his college years. At Madras Institute of Technology (MIT), Chennai, where Kalam studied aeronautics, he learnt an important lesson: the value of time. He was leading a project on system design, when one day the principal walked into the class to see his work. He appeared dissatisfied and told Kalam that he wanted the project finished in the next two days; else his scholarship aid would be withdrawn. That unsettled Kalam; years of his father’s hardships would come to naught. Kalam worked without food and sleep. On the last day, his professor came to check on his progress. He was impressed and said: “I was putting you under stress and asking you to meet a difficult deadline,” recounted Dr Kalam. When Dr Kalam’s first major project SLV 3-failed the first time he was almost shattered. Also, around this time, Kalam’s childhood mentor, Jallaluddin, died. “A part of me too passed away…” said Dr Kalam. But he never thought of quitting after SLV-3. “I knew that for success, we have to work hard and persevere.” And so, SLV-3 was launched again, this time with success. He drew strength from philosophy, religion and literature to tide by his professional setbacks; also a life with few companions. In time, he also learnt to deal with professional jealousy and uncooperative team members. Success followed Dr Kalam. Prithvi, Agni, Akash, Trishul and Nag missiles were huge successes. He was awarded the Padma Bhushan and Bharat Ratna, and then he became the President of India; one of the few presidents who have touched the hearts of so many poor children in the country. Because he also came from a poor background, he knew the power of education in changing one’s future. Visvesvaraya was born in Muddenahalli in the Chikkaballapur Taluk of Kolar District (Mysore State), on the 15th of September 1861. Visvesvaraya completed his early education in Chikkaballapur; then he came to Bangalore for higher education. He joined the Central College. But his pocket was empty and with no roof over his head! A family from Coorg in South India was looking for a tutor for the children. Visvesvaraya, himself a student, became their tutor. He lived with them and also earned a few rupees. The poverty-stricken lad stood high in the B.A. Examination in 1881. He got some help from the Government of Mysore and joined the Science College in Poona to study Engineering. In 1883 he ranked first in the L.C.E. and the F.C.E. Examinations (these were like the B.E. Examination of today). As soon as the results were out the Government of Bombay offered MV a post. He was appointed Assistant Engineer at Nasik. MV was only thirty-two. The Government appointed a Committee; it was to find ways of helping irrigation. Once again it was Visvesvaraya who found a solution. He devised a new system called the Block System. He devised steel doors; these could stop the wasteful flow of water in dams. Even British officers were full of praise for the invention. From Bombay Visvesvaraya went to Hyderabad as Chief Engineer. His great achievement in Hyderabad was the taming of the river Moosa. This river divides the city into two. In 1908 the river was in floods as never before. The waters of the river poured into many houses, and men and cattle were carried away. Visvesvaraya planned dams to tame both the Moosa and another river, the Isa..
Visvesvaraya was the Chief Engineer of Mysore for three years.In those days the Maharaja used to appoint the ministers. There used to be three ministers and the Chief Minister was called the Dewan. In 1912 the Maharaja choose Visvesvaraya as his Dewan. Soon after Visvesvaraya became the Dewan, one of his relatives went to him. He was a man whom MV liked and respected. He was in Government service. He wanted a higher post; that would have given him another fifty rupees a month. Visvesvaraya said ‘No’. But, as long as the relative was alive, he paid him a hundred rupees every month from his pocket. As the Dewan, he got a car from the Government for his use. He used the Government car for government work; for his private work he used his own car. He was such an honest man. The Dewan would be neatly dressed and ready for work by seven in the morning. There was not a crease or a wrinkle anywhere on his clothes. He worked steadily and methodically till one in the Afternoon. He was back to work at three and till eight at night he was at his desk. It is the duty of ministers to tour the state and meet the people and find out what they need, isn’t it? MV had his own way of touring a district. Before the visit, officers were asked to send information about the district. How do the farmers get water, how many tanks are there in the district, how many wells, how many hospitals and how many schools, how many acres of land are used for agriculture – these and a hundred other questions had to be answered by different departments. They had also to explain the needs of the district. Then the Dewan went to the district. He held discussions with the officers and with members of the public. Then he took decisions. As soon as he returned to Bangalore every officer who was to do some thing got a letter. It told him what he was to do. So the Dewan’s visit was made most useful to the Government and to the people. Visvesvaraya believed in the value of education. In those days colleges in Mysore State were under Madras University. Because of MV’s firmness and fight, Mysore University came into being. It was the first university in an Indian state governed by an Indian ruler. MV also made arrangements for the government to give scholarships to intelligent students to go to foreign countries for studies. In 1918 Sri MV retired voluntarily. People think retirement means rest. MV lived for 44 years after he retired from service. He was 101 when he died. Except in the last few days when he was very weak, he wore himself out for the country. Ten years after he retired from government service, floods in the Bhadra put a stop to the work in the Steel Factory in Bhadravati. It fell to Sir MV’s lot to set things right. The General Manager of the factory, an American, said it would take at least six months to reopen the factory. Sir MV thought the period was too long. The officer was stubborn. Sri MV removed him. In a few days he got the factory going. Many officers in the factory belonged to other countries; naturally they were not as interested in the working of the factory as Indians. MV got a number of engineers of Mysore trained. In three years Mysoreans took the places of the foreigners. It was MV’s dream to start an Automobiles Factory and an Aircraft Factory in Mysore State. He worked in this direction from 1935. The Hindustan Aircraft Factory (now called the Hindustan Aeronautics) in Bangalore, and the Premier Automobile Factory in Bombay owe much to his efforts. The rivers of Orissa were frequently in floods; they caused a lot of trouble to the people. It was necessary to tame the rivers and to use the waters for the welfare of the people. MV studied the problems and prepared a report. This report paved the way for the construction of the Hirakud and other huge dams. Any state should be lucky to have a minister of Visvesvaraya’s ability. Would any salary be too high for such a genius? The Maharaja’s secretary suggested to the Maharaja that MV’s salary should be raised; he had not consulted MV. Visvesvaraya came to know about it. He wrote to the Maharaja saying that he did not want a rise. For sometime, when the Bhadravati Factory was in trouble, he worked as the Chairman. At that time, the Government had not decided the salary. It took some years to do so; the Government owed him more than a hundred thousand rupees. But he did not touch a rupee even. He told the Government, “Start an institute where boys can learn some profession.” The Institute was about to start work. The Government wanted to name it after Visvesvaraya. But he said, “Name it after the Maharaja of Mysore.” This is the Sri Jayachamaraja Polytechnic Institute of Bangalore. Free India honors great servants of the country every year by awarding titles. The highest of this award is ‘Bharata Ratna’. 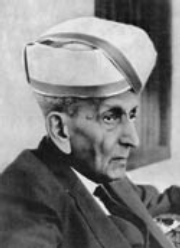 In 1955 Visvesvaraya was made a ‘Bharata Ratna’, the Gem of India. His memory was an amazing as his genius. We saw how in 1908 he tamed the Moosa. Fifty years later, one day, there was a discussion about the river, and he referred to some detail. Then he called a servant and, pointing to a bookshelf, said, “Bring the three or four books in the middle of the third row.” Then he opened one of them and pointed to the detail under discussion on one page. He was 96 or 97 when this happened. How did Visvesvaraya use his genius and his extraordinary memory? This is the important question. He was the embodiment of discipline and hard work. He was never late by a minute and he never wasted a minute. Once a minister was late by three minutes; MV advised him to be punctual. A man should do any work he undertakes methodically – that was his firm faith. Every man should understand his responsibility and do his best – which was the essence of his teaching. He practised this very honestly, and there are hundreds of instances to show this. In 1947 he was the President of the All India Manufacturers’ Association. He had to make a speech at a function. Some of his friends were staying with him. On the day of the function they woke up at half past four in the morning. What they saw astonished them; Sir MV, who was 87, was already up and faultlessly dressed; he was walking up and down; he had in his hands a copy of the speech he was to make and was carefully reading it! In 1952 he went to Patna. He was to study a plan for a bridge across the Ganga. The sun was cruel and the heat unbearable. MV was 92. There were parts of the site to which he could not go by car. The Government had arranged to have him carried in a chair. MV did not use the chair; he got off the car and walked briskly. The Government had also arranged for his stay in the GuestHouse. He would have been comfortable there. But he stayed in the railway coach and went on with the work. Visvesvaraya was dedicated to work. He was also a man of spotless honesty. We saw how, as the Dewan, he refused to favor a relative. In 1918 he decided to give up the Dewanship. He had to give the Maharaja his letter. He went to the palace in the Government car. He returned in his own car. Those were days when people had to work by candlelight. MV used, for official work, the stationery and the candles supplied by the Government; for his private work he used stationery and candles which he had bought. MV had the courage of his convictions. He did what he thought was right and was not afraid of opposition. MV also planned the KIRS dam. The cost was estimated; it came to 25,300 thousand rupees. Officers of Mysore State were shocked and opposed the scheme. At last Visvesvaraya satisfied the Mysore Government with his arguments and it agreed. A new difficulty arose. MV wanted the height to be 130 feet. The Government of India approved a height of only 80 feet. MV went ahead with a foundation for a dam 130 feet high. Later, the Central Government agreed with him. Many people made fun of him when he started the Bhadravati Steel Factory and called it ‘a White Elephant’. Some officers did not manage it properly and the factory suffered heavy losses. Quite a few persons felt happy! But today it is an asset. Somebody once said to him, “You have done great service to the country. You are like Bhishmacharya.” MV said, “You make me remember what a small man I am. What am I before Bhishmacharya?” He was so modest. Even at the age of 95, he rose to receive a visitor; he got up again when the visitor was leaving. But he also knew modesty did not mean pocketing insults. In the old Bombay Province the rules did not permit an Indian to become the Chief Engineer. Only an Englishman could sit in the Chief Engineer’s chair. So MV gave up his post in Bombay. The Dewan was the highest officer in Mysore State. He himself gave up that very high office. He had self-respect without arrogance. Sir MV was a fearless patriot. Those were days when the Englishman was the lord of India and wanted to be treated like a god. The Maharaja of Mysore used to hold a Durbar during the Dasara. On the day of the European Durbar, the Europeans were given comfortable chairs but Indians were required to sit on the floor. MV went to the Durbar for the first time in 1910. The arrangements pained him. The next year he did not attend the Durbar. When the officers of the palace made enquiries he frankly gave the reason. Next year all – Europeans and Indians -were given chairs. A British officer wrote a letter to MV. He said that in the Maharaja’s Durbar, he wanted a cushion to rest his feet because the chair was too high. MV got the legs of the chair shortened and wrote to him that the height had been reduced. The Bhadravati Steel Factory, Mysore University, Krishnarajasagara, the Bank of Mysore – every one of his creations was mighty and magnificent. But far mightier and far more magnificent was the Bharata Ratna, who was at once a matchless Dreamer and Doer. Service of the country was this great man’s ‘tapas’. When he reached the age of 100, people all over India showered affection and respect on the Grand Old Man. The Government of India brought out a stamp in his honor.